A brief blog about the Eurozone today given I am travelling later on in the morning (Thursday, US time). Events in recent days are further exposing the absurd logic inherent in the design of the monetary system arrangements that the EMU member nations signed up for. The sovereign debt crisis that has so far be confined to Greece is now spreading to other member nations (Portugal and Spain). Further, the concerns over sovereign risk are now spreading into the commerical banking system and the logical extension of that are bank runs and a closure of the entire payments system. The reluctance to provide any EMU support for the beleagured Greece and the posturing by Germany is now being overtaken by these events in recent days. The initial “bailout” offer to Greece that took so long for the EMU bosses to make – given it rendered their claims to have constructed a stable sustainable monetary system absurd – now pales into insignificance. Much more support will be required and soon. But even that will not solve the structural flaws in their system. They would be better just abandoning it and maintaining political ties to stop them invading each other. After all, it was the tensions after the Second World War that have, in no small part, driven these flawed attempts at union anyway. In recent days, the dysfunctional logic of the Eurozone is pushing the member countries further in the black hole. First, the structure of their fiscal and monetary policy arrangements meant it was almost impossible for the zone to avoid sharp declines in economic growth and damaging increases in unemployment as private demand collapsed in the wake of the global financial meltdown. It is not often acknowledged but the collapse of their banking system was largely due to the $US credit lines extended to the European Central Bank (ECB) by the US Federal Reserve. So they relied in a not insignificant way on support from outside of their system. Second, as the real economic crisis worsened the automatic stabilisers drove member nation budgets into deficits which were well beyond those allowed by the ridiculous fiscal rules they have erected to “maintain fiscal discipline”. The implications of this have been twofold: (a) a demand for fiscal austerity by the Euro bully bosses in Frankfurt and Brussels – that is, the deliberate imposition of pro-cyclical fiscal policy which is the anathema of sensible and responsible fiscal conduct; and (b) increasing concern by bond markets about the sovereign risk of the more exposed member governments (the so-called PIIGS). This concern has driven up borrowing costs of the member governments who are forced to borrow because by entering the EMU they surrendered their currency sovereignty. In turn, this has created a vicious cycle of increasing deficits, increased risk, higher costs and around in a dangerous circle the meltdown has been spinning. The lack of a credible response from the EMU bosses other than “we will not bailout any member state” worsened the situation and they were finally forced to announce a fairly partial “bailout” plan and the intervention of the IMF which was terminal for any claims that the EMU system was self-contained and able to deal with asymmetric demand shocks. Third, the meltdown is now spreading in two ways, which will further exposes the lack of viability of the EMU currency system. The sovereign risk concerns have now spread and Spain is this week’s Greece. But more damaging is that the sovereign risk issue is morphing into a full-scale private banking crisis which will be hard to arrest should it extend to bank runs at branch level. Logic tells me that this is the direction that the dynamic is taking. And why? Answer: all this is happening because the member governments agreed, voluntarily, to set up a monetary union that was so flawed from its inception that it could never withstand a significant crisis in aggregate demand. The stability of the system relies on continual austerity being imposed on real wages growth and economic growth in general with concomitant, high rates of unemployment being maintained. These recession-biases, in turn, undermine the fiscal status of the member governments who are powerless, by construction, to act. They become lambs for the slaughter as bond markets and the criminally-corrupt ratings agencies go to work on them. As the sovereign crisis spreads into a private banking crisis, the viability of the the entire payments system is threatened. So the voluntarily-imposed neo-liberal madness is now for all to see in the Eurozone at present. And it will get worse because they do not have the policy structures in place that can provide an adequate response to the worsening situation. Humans are very stupid indeed. 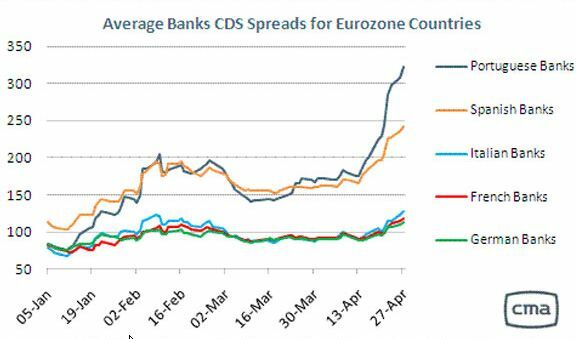 In recent months, the so-called credit-default swaps (CDS) spreads for sovereign government debt in the EMU have risen sharply. These spreads tell you how much extra (relative to the benchmark German bonds) the purchasers of the sovereign debt for specific countries have to pay to insure against default. They are typically closely related to the credit rating assessment. In recent days, the criminal rating agency S&P has declared Greek debt to be of junk quality. I note that overnight the CDS spreads for several EMU nations have fallen a little bit as it is clear the Eurozone bosses will have to announce a more comprehensive guarantee to Greece bond holders. But this seems like a temporary reprieve and the trend is still pointing to some sort of default. The news yesterday was that so-called “haircuts” would be inevitable on Greek sovereign debt – that is, that bond holders might reasonably expect to get some fraction below 100 per cent back when their bonds matured. Within 24 hours I noted the “haircut” was being revised from 80 percent downwards with some of the more extreme estimates suggesting discounts down to 40 per cent. In other words, if these claims are true, then the default process is underway even if there was some correction in the last 24 hours. The sovereign debt crisis started to spread this week as S&P also downgraded Spain. While Greece is a problem for the EMU, Spain is a bigger problem – it is a much larger nation and any bailout would be huge. These developments are now spreading from a worry about sovereign debt exposure to worries about the viability of the banking system in general. The logic is that if these “haircuts” are likely, then the private banks which hold significant volumes of the sovereign debt face huge writedowns to their capital – that is, their own solvency becomes the issue. Of note, is that 80 per cent of the Greek debt claims are on European banks, which means that the debt crisis is highly concentrated among European banks. French banks, for example, hold 25 per cent of the claims on Greek sovereign debt; Swiss banks 20 per cent; German banks around 15 per cent; with US and UK banks holding only around 8 per cent of total claims (Source: Bank of International Settlements database). The following graph should send shivers up your spine. It comes from the financial market data provider CMA Datavision and shows the credit default swap insurance rates for the banks in the various vulnerable EMU member states. So now the “markets” are increasing the price for insuring against bank failure – and the increases are rather sharp. For example, the banks in Portugal and Spain are facing significant widening of the CDS spreads relative to the German and French banks and these sorts of developments start to feed on themselves as irrationality driven by uncertainty becomes dominant. The logic also extends to rising fears that depositors in these banks face losses (given the possible capital writedowns) and if that happens then a total collapse of the financial system becomes possible as investors seek safe havens in other assets such as US federal government debt, other currencies and gold. While the ECB can stop this becoming a cash shortage the downward pressure on the Euro would further reduce the credit standings of the member governments. The end game of this sort of dynamic manifests in a collapse of the payments system and the need to reorganise the financial system. The crisis affecting the eurozone worsened yesterday when Spain’s credit rating was downgraded less than 24 hours after Greece was sent into financial meltdown. Fear of contagion gripped Europe’s financial markets when the debt rating agency Standard & Poor’s cut the rating on Spain’s sovereign bonds. The decision — coming after the agency downgraded Portugal’s rating and cast Greek bonds into the scrapyard, designating them junk — sent the euro plunging against the dollar. What this means is that the initial funding support guarantees reluctantly announced a few weeks ago for Greece which included the embarassing admission that IMF involvement was required now pale into insignificance. Much larger support will have to be announced. The Times that a proposal “to triple the size of a bailout for Greece” is now being considered by the ECB and IMF. However, any bailout will not solve the problem which is sourced in the dysfunctional structure of the entire monetary system. Please read my blogs – Euro zone’s self-imposed meltdown – EMU posturing provides no durable solution – Doomed from the start – for more discussion on this point. This is like Ebola. When you realise you have it you have to cut your leg off in order to survive. It’s threatening the stability of the financial system. The response of the Germans is also predictable and signals that they still don’t get it at all. The German Chancellor said that “in 2000 we had a situation when we were confronted with the question of whether Greece should be able to join the eurozone … It turned out that the decision … may not have been scrutinised closely enough.” Her answer now? Impose even harsher fiscal austerity measures on Greece. But imposing increased will destabilise the system further given that economic growth would continue to decline and the budget deficit in all likelihood would increase. Germany could actually help Greece more by increasing their own domestic demand. But of-course the logic of the EMU and the German intransigence will not allow that obvious (partial) remedy to be explored. With the head of the Organisation for Economic Co-operation and Development, Angel Gurría, comparing the crisis to the ebola virus, the Conservatives and the Liberal Democrats warned of Greek-style problems for Britain unless swift action was taken to repair the public finances. If anyone doubts the dangers that face our country if we do not, they should look at what is happening today in Greece and in Portugal. They also chose to uncritically report similar nonsense from the economics spokesperson for the Liberal Democrats in the UK. But this piece was published under opinion not news. It is one thing to report as news what the major political figures are saying. But when this sort of rubbish appears as an opinion piece written by the two senior economic’s correspondents at the UK Guardian you expect more. The correspondents provide their readers with no critical scrutiny of these absurd claims. They just perpetuate the myth that the sovereign risks faced by an EMU nation (which do not issue their own currency) are comparable to the situation facing a sovereign nation such as the UK. The fact is that the UK government faces no solvency pressures. It issues its own currency under monopoly conditions and can always service its debt obligations. And … not one word by the correspondents questioning the applicability of the situation faced by Greece to the UK. Not one iota of information that we are talking about two currency systems here which are not comparable in any way in relation to the solvency risks attached to national government debt-issuance. These sorts of opinion pieces then become part of the problem. I would sack these journalists. The sun is rising/sleeping yet in Europe/still the same sun. Friday April 28: where is bill? Today (Thursday, US time) I am heading back home to Australia. 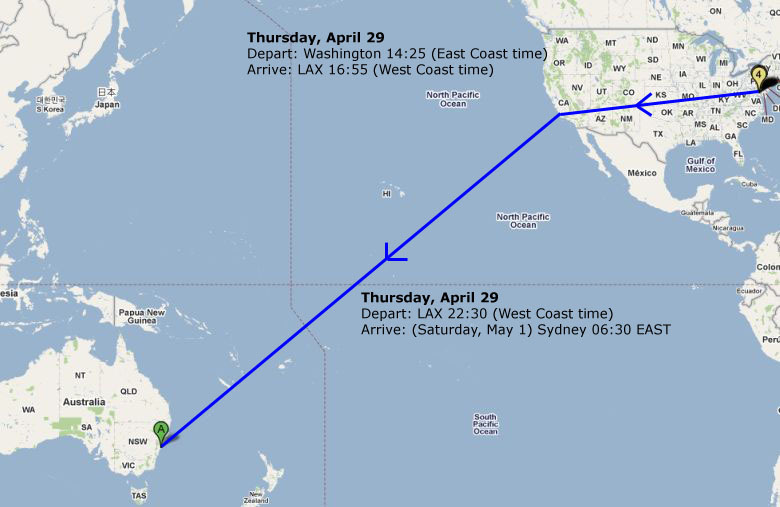 As you can see – two long flights. Its been a productive trip though. Given that I moderate comments in some cases and this is a manual operation there might be some delays over the next 24 hours. I can do this via mobile phone or computer but while actually flying I cannot. So if you have made a comment that my algorithms deem to warrant moderation then please be patient – it will be dealt with within the next 24 hours or so. The Quiz will be back tomorrow and I have 22 hours of travel to think of some devious questions. It will appear sometime tomorrow. Can you explain this? I don’t understand how this is so. It seems to me that their banking system is drastically undercapitalized, and made terrible loans with currency risk mixed in. I agree. Fine. That’s the analysis of wrong thinking and past errors. Something along the line: we told you so. But what’s the solution? To dissolve the EMU might be an option in the long run, but not a fix for current malaise. It takes a lot of time, preparation and money to go back where we started from. In the meantime austerity programs, pro-cyclical policies and accelerating deflation will impoverish the people and/or cause civil upheaval. The only fix I see, is for the ECB to drown the EMU in new money as long as aggregate demand is restrained and inflation only an academic worry. But there’s also an upside: politcians and journalists are starting to become really annoyed by the bond-market and by the rating agencies. Yesterday German president Horst Koehler delivered a harsh speech wondering whether financial markets are of any social benefit at all. And all the newspapers ran stories about the need to reign in the rating agencies or simply ignore them in the future. On replacing this escalating European insanity. The inevitable effects of privately-controlled, competitively-incentivized monetary systems is exactly the runup that you lay out here. “We OWN the lifeboats – the people be damned”. So, to me the problems are beyond predicting the cyclical cause-and-effect of the failed design of the European MONETARY Union structure. It’s like you said earlier, this was the considered decision of the European money-makers; they weighed the possibilities of collapse and decided to wager their futue on success. The probability of the risk of failure is now as close to 100 percent as you can get. The question of the amount of the failure seems driven by the fact that it was one giant “all-in” bet. We are at the transition point where exiting the EMU seems perfectly natural. Without an exit strategy from the EMU structure in the original plan, what are the options that evolve for reducing the amount of damages that the financial collapse burdens onto ordinary working Europeans? I am purposely blind to the historic tensions among these many players. Without reliance on the EMU structure, Greece must first take the step to restore its sovereign currency to the purpose of protecting the people of Greece from the depth of suffering that will be required by a failure to “dis-associate”. Restoring monetary sovereignty is the necessary first step, and likely to evolve at some point soon. But that is not enough. In order for the Greek peoples to realize the benefits of their future works – whatEVER that benefit might be – monetary policy strength must be established by the public-purpose method of issuing its new monies debt-free. My main point is that Greece needs “surface” its own exit-strategy right now. Besides separation from the EMU, there is the matter of government-issuance of its own circulating medium according to its real monetary sovereign powers, which include the ability to operationally implement a system of debt-free, government-issue monies. Time to end the strangle-hold of the debt industry on the world’s peoples evolution toward economic democracy. Krugman has an article I agree with, in which he states that the current crisis may be the only way to dissolve the EMU. Now is when you need to do it, so far from an “I told you so”, correctly identifying the source of the problem and pointing out how to eliminate said problem is the best, most useful path forward. On the other hand, hating on bond markets simply because they are smarter than the politicians and self-deluded public is not helpful. Those markets correctly understand that governments that do not issue their currency face default risk. They correctly see the distinction between fiat and gold-standard monetary systems, whereas the EMU dreamers and politicians do not. If they did, they would recognize the risk that they were walking into — real solvency risks, not made-up market risks. The EMU public and leadership ignored this reality, but the bond markets are acknowledging this reality, and so face a lot of hatred from those who like to maintain the illusion of the gold standard model. OK. I should have asked the question in another context. Given that we have the dumbest government (DE) on earth, which just managed to stage the worst bailout in history what second best option do we have to proceed? The best option to dissolve the EMU in an orderly manner is unfortunately to no avail. Sometimes I wonder. Is the neoliberal “madness” really stupidity, or is it design? After all, it does serve a purpose: it concentrates wealth into few hands very efficiently. By definition almost it is anti-labor: labor is increasingly superfluous, so why support it, might be the underlying argument. Let half the country live at a third-world standard. There are too many people anyway, the argument might continue, there has to be demand reduction. Frankly, it is as if the power-elite were thinking this way. At any rate, the financial powers seem to have more or less engineered a coup d’etat in the US. Some senator, I believe, said that the whole place is in the pockets of the bankers. That is a very serious remark. And the reality doesn’t seem much different in Europe. It’s as if the whole world were being turned into a plutocracy rather like the Latin American countries: islands of riches in a sea of poverty, as someone put it, with plenty of militarization to keep it that way. The second best option is to unify the fiscal policy — unite Europe so that it becomes a currency issuing entity. Then you will see bondmarkets settle down once government debt is with the full faith and credit of a currency issuing nation. If you have a portable profession, go to L. America. For those who have an income it is very pleasant. You just need to drum up stimulating conversation, so pick a place like Buenos Aires, for example. Anyway, governments are stupid everywhere, so go where they are largely ignored, but where the populace is at least relatively civilized. As for myself, I’ve started to hate anything with prefix “E” or “EU” from the day when Brussels along with London/Paris/Berlin where major cause of mayhem and calamity in former Yugoslavia. Not to mention Washington. I’ll be really, really glad to see dissolution of EU, which is nothing but the imperial project of Berlin and Paris. I think this refers to the seven hour time lag between JAP – EU. And maybe obliquely to the Japanese Prime Minister’s belief that in Japan, their eyes are alreay open …. !